Gawthrop Greenwood Partner Patrick M. McKenna Welcomes 69 New U.S. Citizens During Naturalization Ceremony at Justice Center – Gawthrop Greenwood, PC. Gawthrop Greenwood, PC was proud to participate in the naturalization ceremony for 69 new U.S. citizens from 28 countries on March 22, 2019. 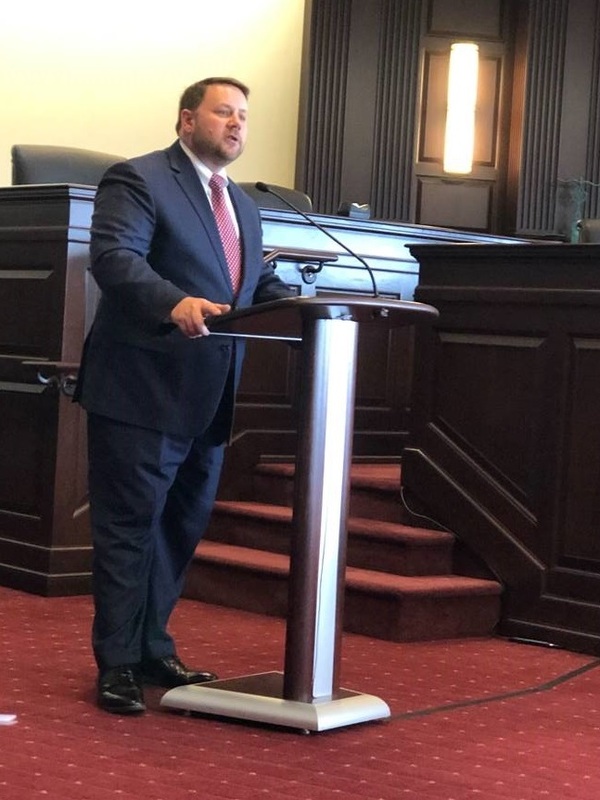 As President of the Chester County Bar Association, Gawthrop Greenwood partner Patrick M. McKenna was invited to address the new American citizens during the ceremony in Courtroom One of the Chester County Justice Center with President Judge Jacqueline C. Cody presiding. “Each of you has your own story of courage, determination and sacrifice as you journeyed to America to seek for yourselves the promises and opportunities guaranteed to all of our citizens by our Constitution. I commend each of you for completing your journey to become a citizen. You chose your path voluntarily. You are American now by choice, not by the fortune of birth. You are now an important part of our living history as this country continues to grow and evolve,” said McKenna. A full transcript of McKenna’s remarks is included below. Good morning, President Judge Cody, Honorable Judges of the Court of Common Pleas, distinguished guests, family and friends. And to our newest fellow Americans I say welcome and congratulations. My name is Patrick McKenna, and I am the President of the Chester County Bar Association. It is my honor and privilege to speak to you this morning as we recognize and celebrate your journey to United States citizenship. As I stand before you, I am filled with a tremendous sense of pride to have the opportunity to welcome you as brothers and sisters of our great Nation. Each of you has your own story of courage, determination and sacrifice as you journeyed to America to seek for yourselves the promises and opportunities guaranteed to all of our citizens by our Constitution. I commend each of you for completing your journey to become a citizen. You chose your path voluntarily. You are American now by choice, not by the fortune of birth. You are now an important part of our living history as this country continues to grow and evolve. Today you join a Nation created “of the people, by the people.” Our Nation was founded on the ideal that each of us has the right to life, liberty and the pursuit of happiness, as embodied in the fundamental belief of the freedom of expression. Here in Pennsylvania, as a Commonwealth we are a community that was formed for the common good and welfare of all in which the citizens choose their government and make their laws by majority vote. Perhaps most importantly in Pennsylvania is our varied local form of government that ensures and encourages our voices and ideas to be heard in our communities. Fundamental to the success of our Country and Government is our diversity of ideas, cultures and experiences as they shape and inform each of us in our daily lives. Each of you here this morning has the power to influence life in this country. The voice of our government lies with its citizens and I urge you to take the time and opportunity to be heard. Our democratic process only works if you have the willingness to participate in it. What does that mean? It means that with your new status you are afforded the opportunity to be heard in each and every election through the power of the ballot. Take the time to vote and select the leaders of our Commonwealth and Nation. Answer the call to jury duty. Your participation in our justice system is a fundamental responsibility to resolving disputes and ensuring justice through due process of law. Exercise your right to freedom of expression by holding your elected officials accountable for actions or inaction. Speak your mind, express an opinion; the impact can be immeasurable. Finally, actively participate in making your own local community a better place to live and thrive. It is through this collective effort, of which you are now an integral part, that our country will continue to prosper. Today you join a country that is made better because of your presence. Your presence here today is an affirmation of the values of this great Nation and serves as a reminder to me of how lucky I am to live here as your neighbor. I wish you all great happiness, prosperity and success in all that you do as fellow citizens of our United States. Thank you and congratulations.